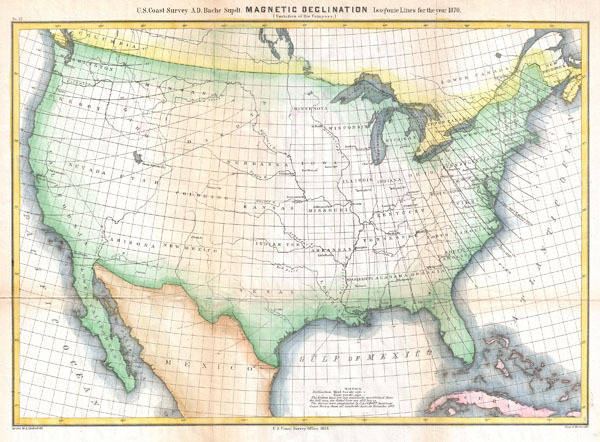 A highly unusual U.S. Coast Survey chart of the United States showing magnetic declination in the year 1870. Magnetic Declination, or as it is more commonly known Magnetic Variance, refers to the difference between true north and compass north. Magnetic variance changes both over time and from place to place, consequently accounting for compass errors was a major obstacle for many early cartographers. Today the magnetic variance in Florida is 0 degrees, but when this chart was made in 1870, the 0 degree point was in South Carolina. A cartographer traveling north from South Carolina to Maine would find that his compass miscalculated north by nearly 18 degrees! In other places the variance is even more extreme. Compiled under the direction of A. D. Bache, Superintendent of the Survey of the Coast of the United States and one of the most influential American cartographers of the 19th century. Report of the Superintendant of the United States Coast Survey, Washington, (1870 edition).